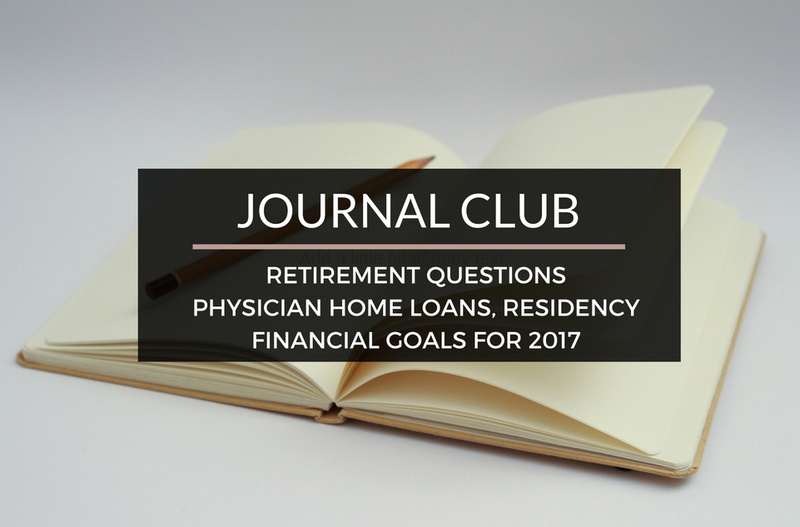 Journal Club 1-7-17 | Passive Income M.D. We all think about retirement. If we didn’t we wouldn’t have sites like mine or The White Coat Investor’s. Here’s a great post on some Common Questions About Investing in Retirement. It was a great recap for me and got me thinking. Check out the great comments as well. The White Coat Investor is playing a double header here on this week’s Journal Club. I used a physician loan to buy my home out of fellowship and it worked out great for me, but is it for everyone? Here’s a post titled My Experience Pursuing a Physician Mortgage Loan. Back when I was in residency, we used to have to walk to the hospital through the snow, up a hill, in clogs. Then we’d stay there for 48 hours straight. Okay, the only part of this that’s the truth is that I wore clogs. Don’t we all feel that back in our day, things were much tougher? Investing Doc gives a rebuttal in Rant: Residency Was Not Harder Back in Your Day. One of my favorite non-physician financial blogs is Good Financial Cents, by Jeff Rose. For the new year he’s posted his list of The Top 10 Good Financial Goals That Everyone Should Have in 2017. How many are you striving for? What a great start to 2017! I was slated to work on New Year’s Eve, but instead was able to give up that shift so I could….. sit on the couch and watch the ball drop with my wife. I can’t think of a better way to end 2016 and start 2017. I’m also currently on vacation with the wife and kids, our first as a complete family. Although it’s quite chaotic, it gives me a glimpse of what the next 15-20 years will look like. Again, I can’t think of a better way to spend my time and I’m grateful for this. Here’s to a fantastic 2017, full of memorable experiences with great friends and family!! !